Sitting directly behind First Lady Melania Trump, Santee’s Joseph Reilly was name-checked by President Trump near the start of Tuesday’s State of the Union Address. 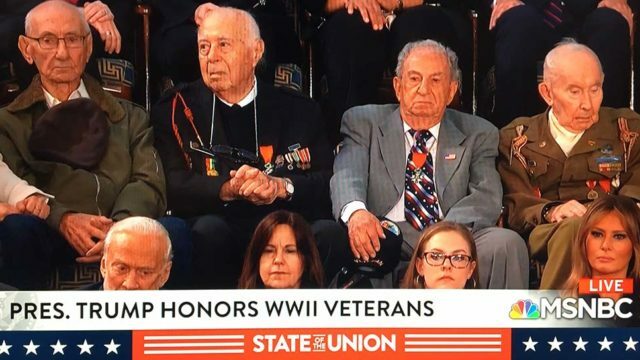 Reilly — wearing a brown uniform and staying seated — was one of three World War II veterans recognized. “On D-Day, June 6, 1944, 15,000 young American men jumped from the skies, and 60,000 more stormed in from the sea to save our civilization from tyranny,” Trump said, noting the coming 75th anniversary of that pivotal event. Reilly was 97 last May when he was honored at Memorial Day services at Mount Soledad National Veterans Memorial. A private in the 101st Airborne Division, Reilly was with the Screaming Eagles. He was a paratrooper who landed on Normandy’s Utah Beach at 3:30 a.m. D-Day. Reilly is a longtime member of Guardian Angels Catholic Church in Santee. “Joe Reilly is a very staunch Democrat who loves his country dearly,” said Sister Mary Potter, who led the parish’s religious education program until retiring recently to County Galway, Ireland. Potter said Reilly is a member of Knights of Columbus at Guardian Angels and was usher at 5 p.m. Saturday Mass for many years. It wasn’t Reilly’s first time in the first lady’s presence. In July 2017, a Facebook post by the Greatest Generations Foundation included a photo of Reilly shaking Melania Trump’s hand at a Paris event marking the 100th anniversary of America’s arrival in France during World War I. “Special thanks to President Trump and the First Lady Melania Trump, Joint Chiefs Chairman and Marine Gen. Joseph Dunford and the amazing staff at the U.S. Embassy for welcoming our esteemed Normandy veterans back to Paris for this special and historic occasion,” said the post. County Supervisor Nathan Fletcher, a Democrat, tweeted a video of Reilly condemning racism and discrimination by religion, ethnicity or national origin. The president introduces three American veterans from D-Day: Private First Class Joseph Reilly, Staff Sgt. Irving Locker, and Sgt. Herman Zeitchik. The White House also tweeted a photo of Reilly.